1 red chilli, seeded and cut into small triangles. Score the inside of the squid and cut into slices. Season with a pinch of salt and a dash of pepper and leave for about five minutes. Blanch the squid in boiling water for 20 to 30 seconds. Drain and put aside. Deep-fry tempeh cubes in hot oil until golden brown and crispy. Dish out. Leave one tablespoon hot oil in the wok and sauté petai until it changes colour. Dish out. Heat sesame oil in a clean wok and sauté blended ingredients (A). Continue to fry till fragrant. 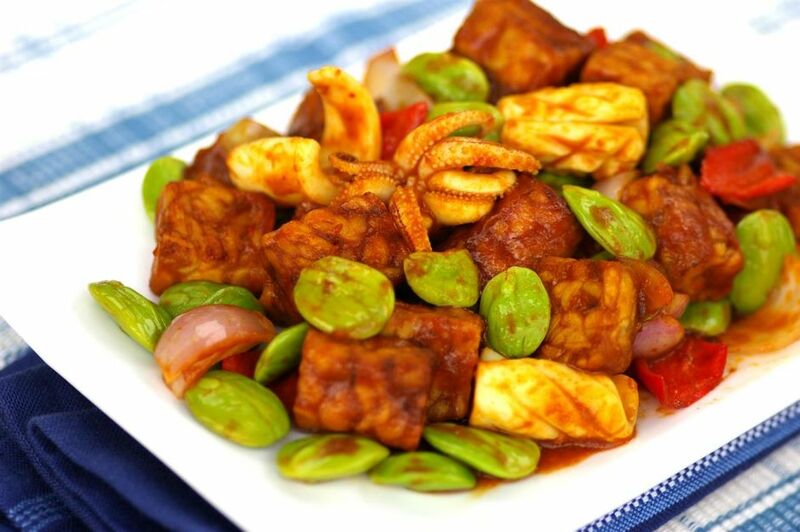 Add sauce ingredients (B), chilli and prefried tempeh, petai and squid. Toss and stir-fry until well combined. Dish out and serve.